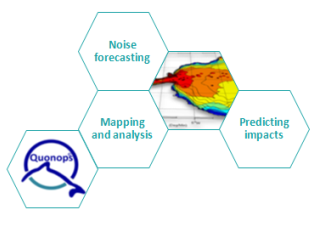 Quiet-Oceans has followed the example of meteorological and oceanographic forecasting to develop Quonops©, a noise management and forecasting system for natural and anthropogenic noise. This patented operational platform maps the spatio-temporal distribution of noise levels generated by combined human marine activity at watershed scale. Unseen marine activity is widespread and includes work linked to renewable energy development, offshore construction techniques, maritime traffic, etc. Establish compliant offshore and maritime construction sites to reduce environmental risks. Determine and Monitor Noise Good Environmental Status. Understand the impact of anthropogenic noise on the marine environment.